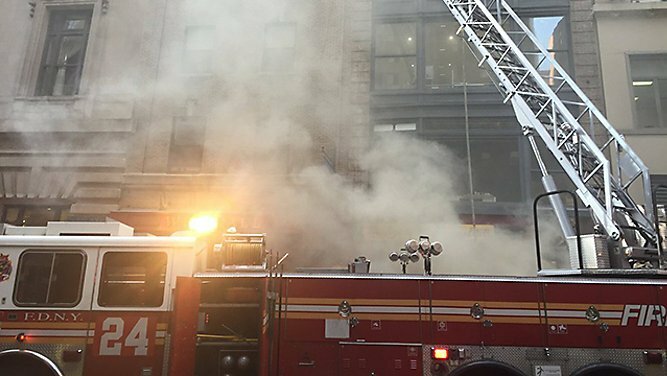 15 people, including 14 firefighters, were hurt Tuesday due to a four-alarm fire inside a commercial building in Midtown. The city fire department said the blaze started around 4:15 p.m. in the kitchen area of a restaurant on 39th St. in between 5th and 6th Ave. before it spread to the first-floor ceiling and the ductwork and walls of the six-story building. The fire was under control by 7:55 p.m. The FDNY said everyone hurt suffered non-life-threatening injuries, mostly attributable to heat exhaustion. Officials have not confirmed how the blaze started. The Department of Housing Preservation and Development said the building’s owner, Pantheon Realty, has five open construction violations. It has not been confirmed if the violations are for the restaurant or the building as a whole.